So it is the week after last week’s Beer, Cider, Folk and Blues Festival. Thanks to all who came, helped, played, drank, listened, danced and made it a big success. After what were an exhausting few days I, Duncan, set about firming up a load of bookings for musicians to play at the club over the coming months. I also started the next round of beer planning. We’ve now got a host of great music acts booked, and great beers. I was about to look at the various email lists I have (Ale Mail, festivals, Music) and decide what to put in several different emails, when my wife got called in to hospital for an operation she has been waiting for. So, I decided that rather than trying to decide who gets what, and some of you getting more than one email. I would put the whole lot into this! So below you will find information for real ale (and cider) drinkers. Then for Jazz, Folk, Blues, Roots, Country and Bluegrass fans. for those who enjoy all of it, you are in for a treat. Scroll down for real ale events – we’ve got a few planned! A day out on the East Kent Green Hop Breweries Tour. 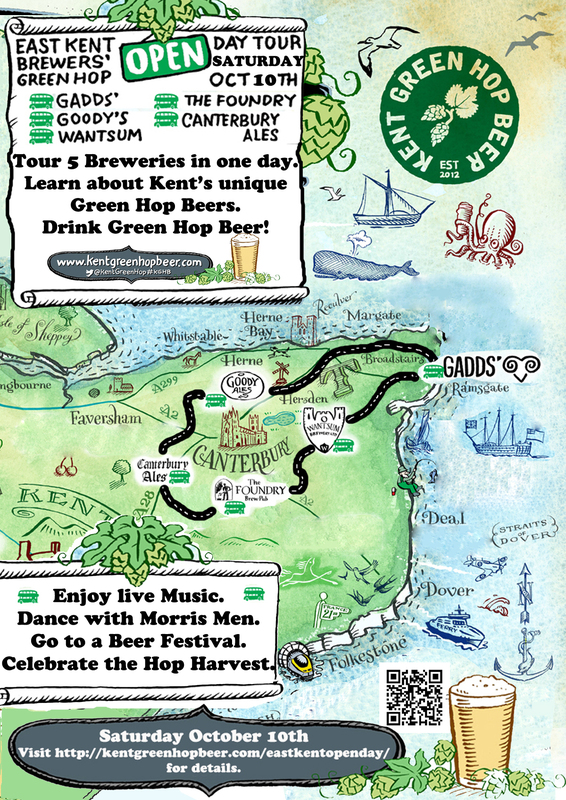 bus round the Five breweries in east Kent that have arranged to open their doors to the public on Saturday 10th October for tours, music, food & Kent Green Hop beers. Cup being screened. We will be meeting from 9.00 am at St Mary Cray station, in order for people to purchase group save tickets (as required). We are aiming to catch the 09.21 train to Canterbury East, arriving 10.36 am. Please book and pay for your brewery bus ticket(s) below (Â£10 + booking fee), and email orplibclub@gmail.com to let us know you are coming so we can meet you at St Mary Cray Station. What it says on the tin! We are delighted to win this for a second time. We’ll have great beer, food, probably a bit of music, a presentation and some fun. Free entry. But non members should register using the link at least 48 hours in advance to keep it legal! 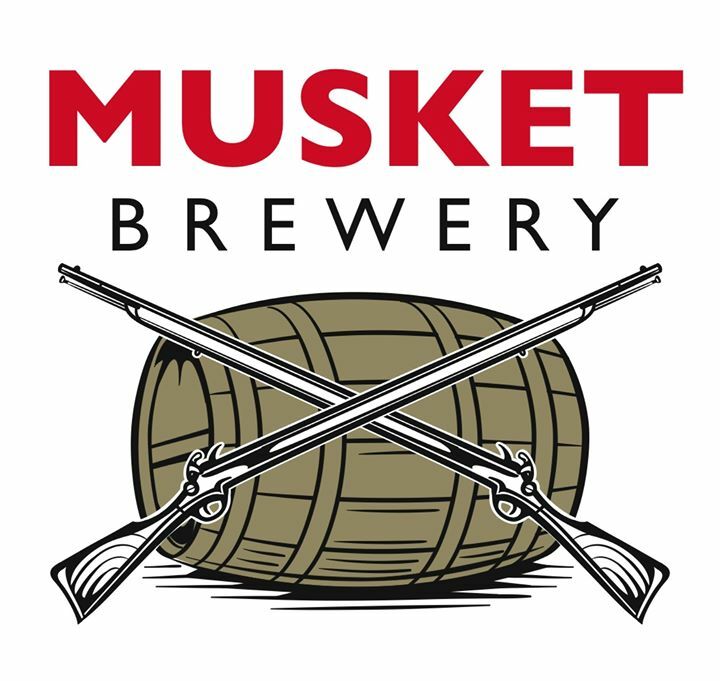 Musket Brewery is a microbrewery based at Loddington Farm, Linton in the heart of the Kent countryside brewing very traditional Kentish style beers. Non members should register using the link at least 48 hours in advance to keep it legal! 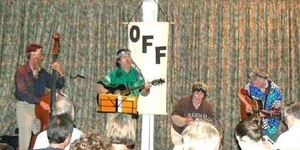 After 28 years Orpington Friday Folk will be coming to an end on 30 October, but they are going out with a bang, with a string of guest nights and a big farewell night. 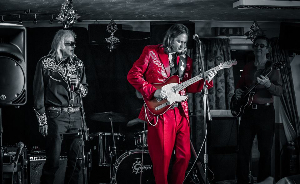 But the show goes on, and as well as the excellent Orpington Folk n Blues nights, the club has booked some superb acts for Friday and Saturday nights from the worlds of Jazz, Folk, Blues and Country. Scroll down to book tickets for Hank Wangford, Mick Groves, Jo Fooks, Mississippi MacDonald, Tred and Ange Hardy. 2nd and 4th Tuesday of the month – upcoming dates 8 September, 22 September, 13 October, 27 October, 10 November, 24 November. OFnB ran our beer festival music. OFnB sessions are open for players and listeners, but if you plan to come and play get there early as the list fills up quickly. 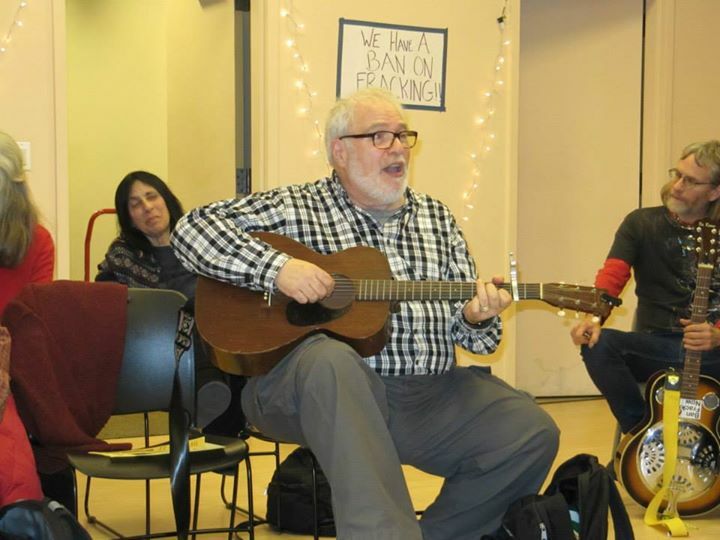 The emphasis is on upbeat songs in the Roots, Blues, folk and Bluegrass genres. 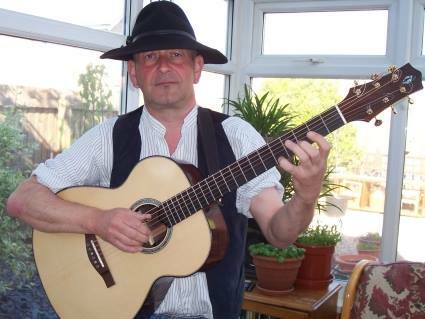 Phil’s solo music career began almost 25 years ago and he is now widely regarded as one of the finest and most distinctive guitarists working on the current UK acoustic / folk music circuit. Skynflynt is a Kent based band presenting a unique blend of traditional and contemporary music using a wide variety of instruments. Well known throughout the countyâ€™s music clubs with a relaxed style that involves the listener and gives them wide appeal. 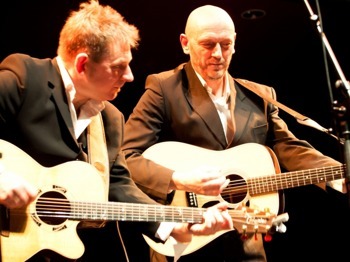 Based in Newcastle Upon Tyne JINSKI are two highly individual guitarists/musicians with strong distinctive voices. JINSKI have a wealth of great original songs that draw upon acoustic roots and country music whilst remaining resolutely modern. JINSKI play songs that tell stories of love, joy, loneliness and longing. Intricate, soulful, beautiful songs, foot stomping, sing-a-long, raucous songs; music for the head and the heart, full of passion and originality. After 28 Fun filled years, OFF closes on Friday, October 30th 2015 – but Live music will continue at Orpington Liberal Club. The evening will be a singers format featuring as many of OFF’s friends as we can fit in. Starting at 6.00 with 24 acts, ending at midnight. 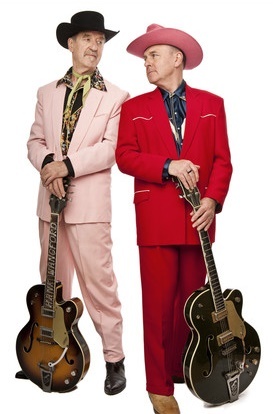 Hank has joined up with his old musical buddy and saddlepal Brad Breath aka Andy Roberts. 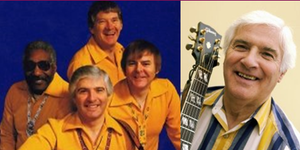 Together they have been touring round the village halls that Hank loves so much and doing the smaller gigs that are too small or low paid for the whole Lost Cowboys posse. Misery and melody, raw emotion and open ribcages continue to be their trademark whatever form they take. 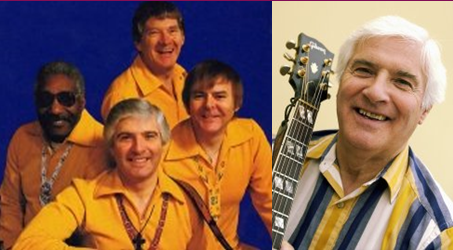 Former singer and guitarist with top 60s/70s folk band The Spinners, Mick Groves, plays at Orpington Liberal Club. 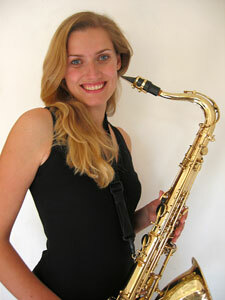 Top Jazz saxophonist Jo Fooks, formerly in Humphrey Littleton’s band, brings her quartet. Jo Fooks, born in Edinburgh, began learning the saxophone at 15. 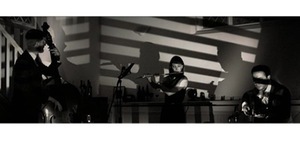 In 1992 she won ‘The Young Scottish Jazz Musician of the Year’. Inspired and encouraged by local Edinburgh musicians, Jo went on to study saxophone at the Guildhall School of music in London (1995-99). She also studied at the Berklee School of music in Boston after receiving a full fee scholarship for the summer jazz programme. After recording her debut album “Here and Now!”, the legendary British trumpeter Humphrey Lyttelton invited her to join his eight-piece band. With whom she toured and performed in some of the most amazing theatres and venues in Britain. Humphs fun filled and melodic approach to music was to be a huge influence. And through performing in his band Jo also recorded and worked with Acker Bilk and played alongside Tina May, Joe Temperley, Scott Hamilton, Elkie Brooks,and many others. Mississippi MacDonald is a blues musician from London. 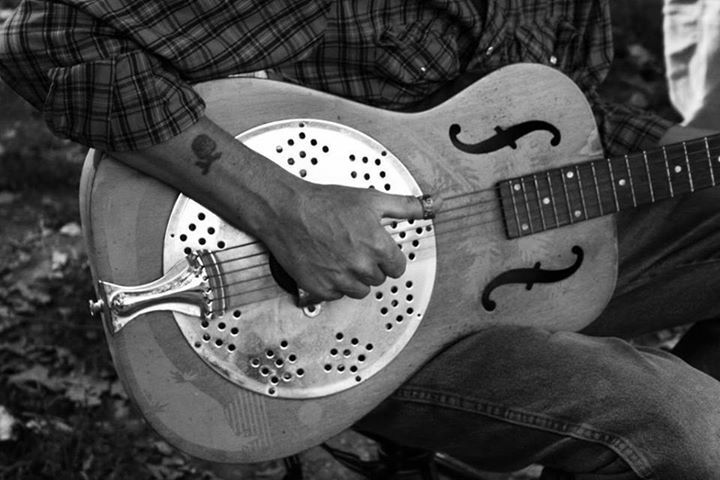 He has been playing since he was 11 years old and has travelled extensively on the US blues trail. He has met BB King, Pinetop Perkins, Willie â€˜Big Eyesâ€™ Smith and Lucky Peterson. When they played here before they lured people in from the bar who had just come in for a beer and they will be hugely popular with jazz and folk (as well as Ian Anderson!) fans alike. 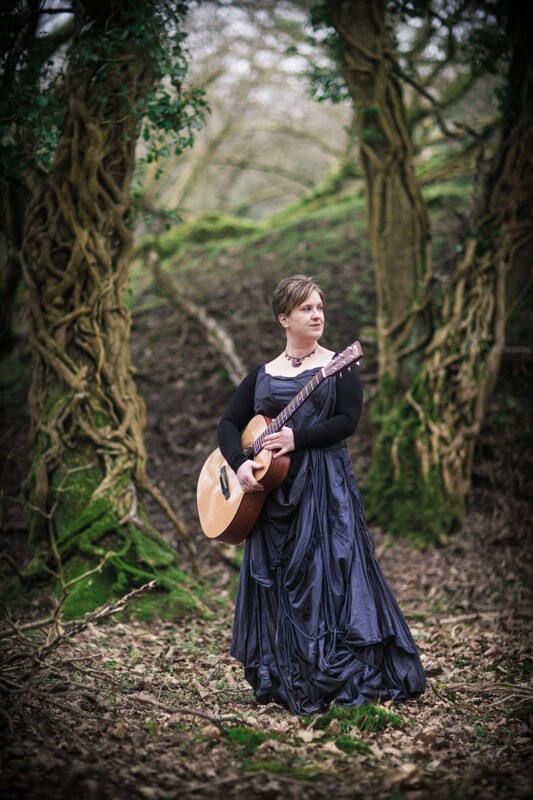 Nominated for the Horizon Award for best emerging talent at the 2015 BBC Radio 2 Folk Awards, Ange Hardy is a folk singer, songwriter and recording artist from West Somerset, England. Ange performs original contemporary songs written in a traditional style with an emphasis on vocal harmony. Ange is currently touring with three different guitars, a bag of low whistles, a bodhrÃ¡n drum, a tambourine, a 27-string Salvi Harp and a shruti box. Combined with her innovative use of live looping for vocal harmonies sheâ€™s one of the most diverse solo-artists you’re likely to encounter. Shortly after winning FATEA Female Vocalist of the Year award in January 2014 she was referred to by veteran folk broadcaster Mike Harding as â€œone of the bright stars of the new wave of folk singersâ€ and since then Ange Hardy has established an enviable reputation as one of the fastest emerging folk acts in the UK. She released her third studio album â€˜The Lament of The Black Sheepâ€™ to a packed theatre audience in September 2014. The album went on to receive international acclaim and was one of only three folk albums last year to be awarded 5-stars by The Telegraph. Bringing the story full circle it was in January 2015 awarded FATEAâ€™s most prestigious award of all, Album of the Year, in the same week that Mike Harding referred to Ange Hardy as â€œone of the most interesting, powerful and talented singers and songwriters to come out of the last couple of yearsâ€. Tonbridge Coppernob 3.8% Fairly dry summer ale with a light maltiness and delicate bitterness. The fruity taste and aroma is provided by Kent grown Fuggles, Challenger and Golding hops. £2.70. LocAle. Tring Kotulu 4.0% Hoppy beer brewed with New Zealand Hops and rye crystal malt. £2.70. Hertfordshire. Downlands Dark 4.1% A dark malty beer – a sweeter, fruity, malty palette. £2.70. Sussex. RCH Blackberry Slug 4.5% A variation on a traditional black porter. Full-bodied with tastes of chocolate and coffee, but with a touch of blackberry flavouring. £2.70. Somerset. Elland Pacifica 4.6% A golden beer brewed with New Zealand Pacific Jade and Pacifica hops producing hints of orange marmalde and black pepper with a citrus aroma. £2.70. Yorkshire. Exeter Ferryman 4.2% A copper coloured Premium ale. Beautifully well balanced flavour enhanced with generous handfuls of English Goldings hops. £2.70. Devon. 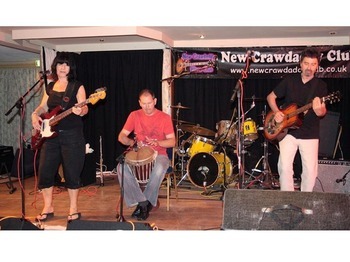 Mick Groves, the former Spinners members, will be playing at Orpington Liberal Club on Friday, 4 December. Tickets will be £6 each in advance over the bar, £8 on the door or can be purchased online now for £6.40. Please note, if buying online, our payments are handled by Paypal, but you do not need a PayPal account to purchase tickets. You will not be posted a ticket, please bring your PayPal receipt to collect your ticket. This Monday night we have the second beer from our new nearest brewer – Brew Buddies PA01 Hallertauer Hersbrucker Pale Ale 3.5%. All but two pints of the last Brew Buddies went in a night, so you had better get in on Monday to try this one. Brew Buddies PA01 is a very light and refreshing pale ale; ideally suited to the warm summer months. Brewed with Challenger bittering hops, Hallertauer Hersbrucker aroma hops and dry hopped with a mixture of Mosaic and Hersbruker it exhibits subtle bittering with a mild, floral and slightly fruity taste. Mauldons Mole Trap 3.8% A traditional mid-brown bitter coloured beer. Well balanced beer with a crisp bitterness, and malty flavours in the finish. Suffolk. £2.70. Tickets for our August Bank Holiday Beer and Cider Festival are available now. The festival is for one day only from 11am to 11pm on Saturday, 29 August. The theme this time is that there is no theme! There will be local beers and beers from far away. Golden beers, pale beers, tawny beers, dark beers. Bitters, IPAs, Stout, Porter, Mild (hopefully) and probably the odd Saison. Fined beers and unfined beers.The planned list of beers can be seen by clicking on the buy tickets link below (don’t worry, you can read the list without buying tickets. There will be live music from Orpington Folk & Blues and we are hoping for the Ravensbourne Morris Men. And of course we will be striking up the barbecue. Tickets for the Saturday can be bought using the link below. Tickets are £6.40 each online or £6.00 over the bar. This includes purchase of your first two pints (you all know the format by now). A £3 glass deposit will be taken on the day. Buy tickets for Saturday now! Plus your usually weekly Ale Mail! Tonight, we have the first cask beer from our new nearest brewery – Brew Buddies in Swanley Village. 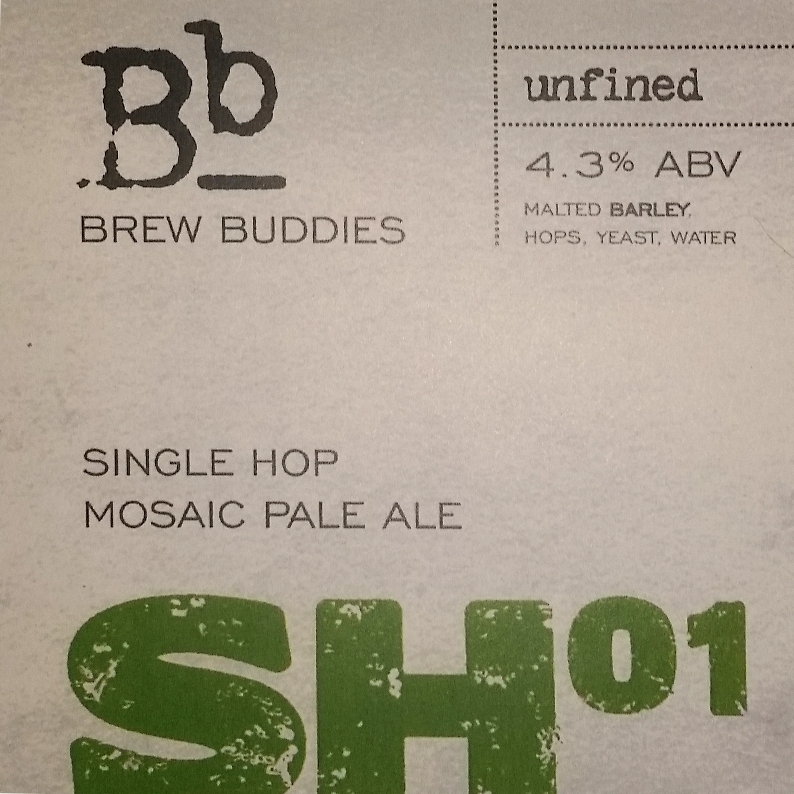 Brew Buddies SH01 Single Hop Mosaic Pale Ale 4.3%. Starts at 8pm and at least one of the Brew Buddies will be along. Don’t forget, you can see an up to date list of what real ale, cider and perry we have on by going to the listing on our website. This is powered by Perfect Pint and clicking on any beer/cider will bring up more details. Musket Muzzleloader 4.5% Our Kentish Ale envokes the faint spicy aroma of well-seasoned, smoked cedar logs and orange drifts from this full-bodied bitter. LocAle. Linton. £2.70. Salopian Hop Twister 4.5% The palate is fresh, piercing and focused, with soft malt overtones and pronounced citrus flavours. A strong focus of taut, lemony, grapefruit on the finish which is balanced by a dry bitterness. 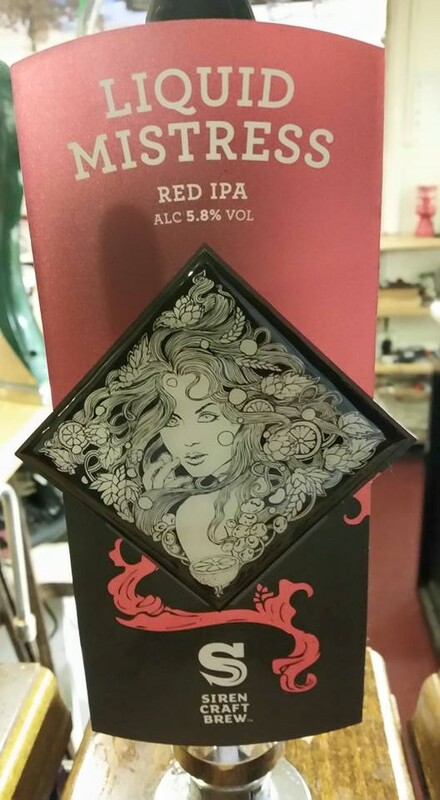 Awards: SIBA National Champion Premium Beer Silver 2015, Bronze Golden Beer Category Champion Beer of Britain 2014, West Mids CAMRA Golden Beer of the Year 2013. Silver Best Bitter Category CAMRA Champion Beer of Britain 2012. Shropshire. £2.70. The main festival is for one day only from 11am to 11pm on Saturday, 29 August. The theme this time is that there is no theme! Follow the buy tickets link to see how the beer list is taking shape. Tickets for the Saturday can be bought using the link below (but keep scrolling to read about our invitation only preview night). Tickets are £6.40 each online and can be bought now. Paper tickets will be available over the bar at £6.00 each soon. This includes purchase of your first two pints (you all know the format by now). A £3 glass deposit will be taken on the day. Click here to buy tickets for Saturday now! Copyright © 2015 Orpington Liberal Club, All rights reserved. 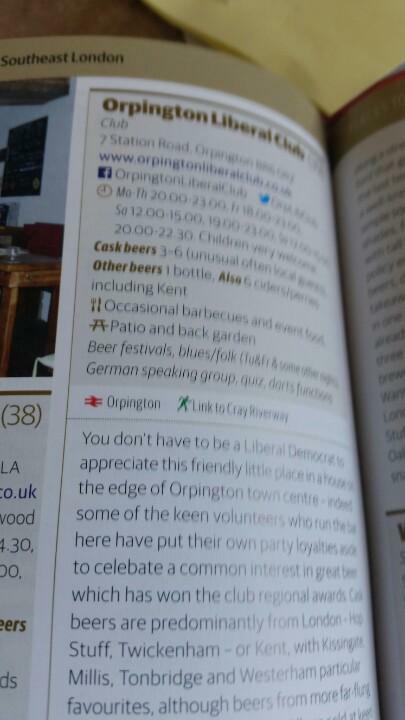 We are delighted to have appeared in the second edition of The CAMRA Guide to London’s Best Beer, Pubs and Bars by Des de Moor. As far as we can tell we one of only two clubs to appear in the book. 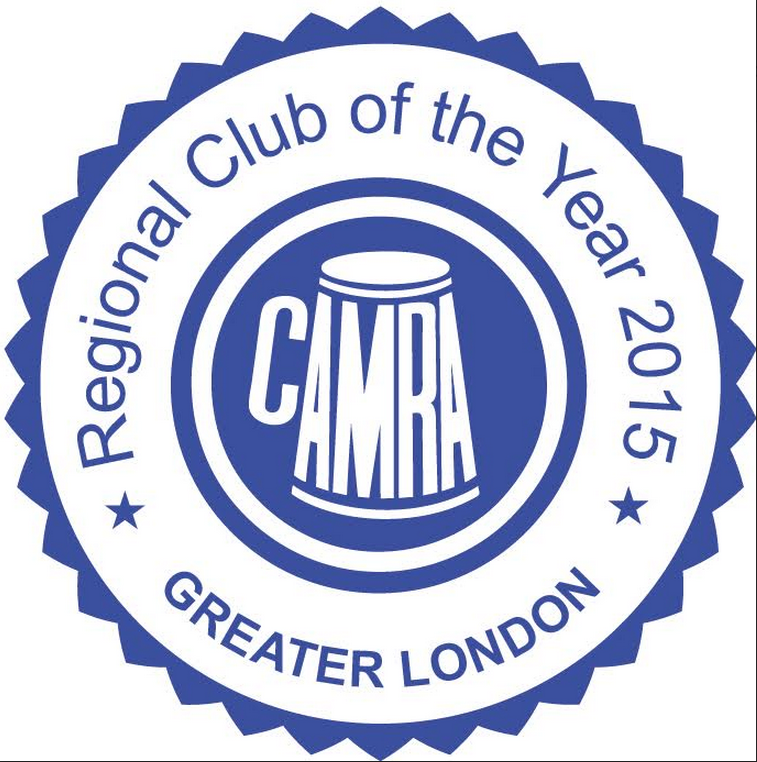 You can get a copy from CAMRA by following this link. Last night we were delighted to welcome The Allen Family Band to the club for a sell out full house. Coming next: Hackney Golden, Pitfield Ocean Warrior, Kissingate Smelter’s Stout. We have been struggling to buy beers under 4% in the lower end of the purchase price range we had set. So we’ve had to make a change. 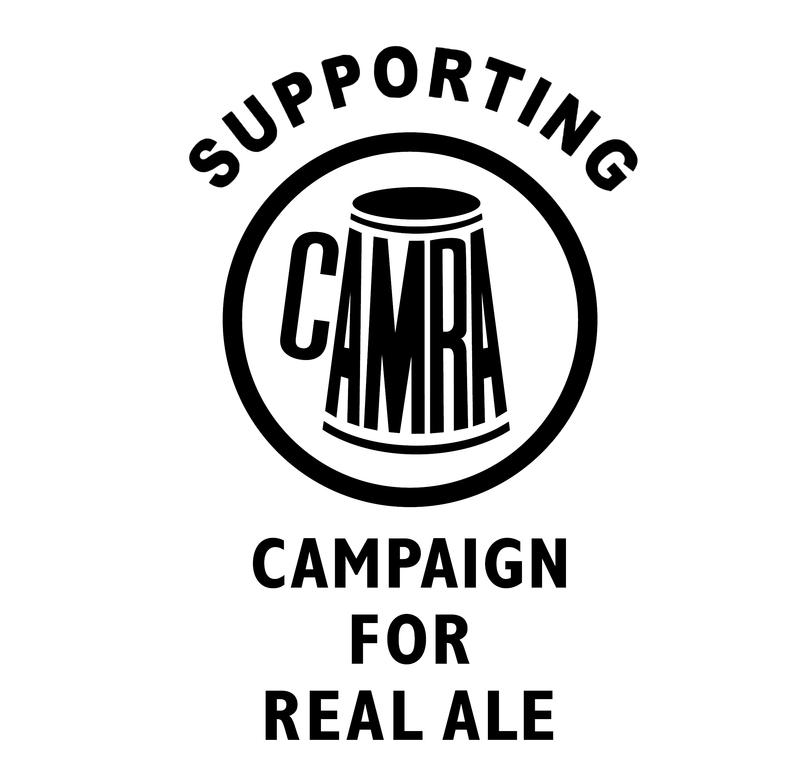 From now on, all real ale under 5% will be £2.70 a pint, and all real ale at 5% or higher is £3.00 a pint. £2.70 is 10p more than we charged 8 years ago for Greene King IPA! As a write this I am nearly two hours into my birthday, and there is no way I was not putting my favourite UK brewed beer this weekend. The brewers description: A 5.8% west coast bright red ale: burnt raisins and crackers balanced by citrus. Liquid Mistress is our femme fatale – mysterious, seductive and disarming. She draws and charms drinkers with her full, red colours. You will soon desire her biscuit-and-burnt-raisin malt base, and peach and grapefruit spark. Her devious hop hit will steal your breath. Hackney New Zealand Pale. 4.5%. Not the same as the one last year. Hopped with Nelson Sauvin. Locale. £2.70. Burton Bridge Top Dog Stout. 5.0%. Colour: Black. Nose: Strong Chocolate malt. Taste: Malty with full-bodied rounded bitterness. Hops: Challenger. Malt: Pale & Chocolate. Staffordshire. £3.00. Hackney Best Bitter 4.4% A traditional ale inspired by the British classic. Locale. £2.70.